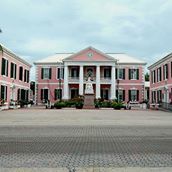 News TV Channel / The Parliament of the Bahamas is composed of the House of Assembly, the Senate, and the Monarch. As a bicameral body, the legislature in its organisation and functions, closely follows the canons of the Westminster system. It meets in Nassau, the capital. The House of Assembly is the lower chamber. It consists of 41 members, elected from individual constituencies for five-year terms. As under the Westminster system, the government may dissolve the parliament and call elections at any time. The House of Assembly performs all major legislative functions. The Prime Minister is the leader of the party controlling the majority of the House of Assembly seats. The Senate (upper house) consists of 16 members appointed by the Governor-General. Nine of these senators are selected on the advice of the Prime Minister, four on the advice of the Leader of the Opposition, and three on the advice of the Prime Minister after consultation with the Leader of the Opposition.